Superior Spiderman #26 spins an action packed web out of the aftermath last issues giant sized special, as the Avengers confront Spiderman about his actions, while all out war breaks out between the original Green Goblin and the original Hobgoblin. The Green Goblin’s activities in recent months, as he slowly took over organized crime in the city, have gradually encroached on the Hobgoblin’s schemes. Now we finally get the confrontation we’ve all been waiting for, as Osborn and Kingsley slug it out in a no holds barred fight to the finish. I like how Dann Slott keeps the banter going between the Goblin’s, especially as they taunt each other. 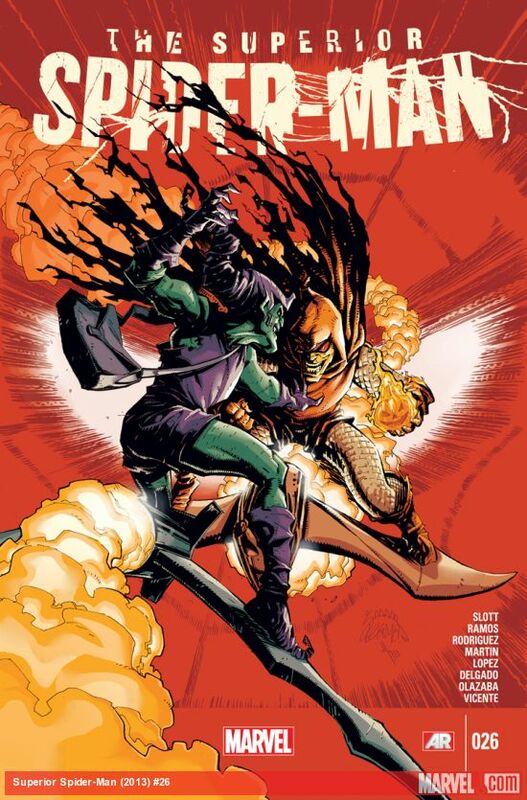 But are we really witnessing a fight between the original Green Goblin and the Hobgoblin? Although we haven’t actually seen Norman Osborn since he vanished from hospital, this Green Goblin certainly seems to be Osborn. There is a point where Dan Slott ingeniously weaves this into the narrative of the fight itself, which leads to a very surprising outcome. Things become even more strained between Superior Spiderman and the Avengers when they summon him to Avengers Tower to confront him about secretly deleting his medical scans. While Otto-Spidey faces up to some difficult questions, somewhere in some bizarre mindscape of their shared psyche, the consciousness of Peter Parker scours the remains of his memories for some way to fight back against Otto. Superior Spiderman #26 has three artists working on this issue, with the action split between Humberto Ramos, Javier Rodrigues, and Marcos Martin respectively. Having multiple artists working on an issue like this can sometimes affect the flow of the story, different artistic styles don’t always work well together either. On the whole I thought this issue looked great, the shift between artistic styles works really well, and actually manages to succeed in enhancing certain aspects of the story rather than detracting from it in any way. Superior Spiderman #26 is another exciting issue by Dan Slott, every twist of the story means you never know quite what to expect next, the scenes in the mindscape as Peter explores what’s left of his memories are especially poignant, and the battle between the Green Goblin and the Hobgoblin reaches a thrilling climax. 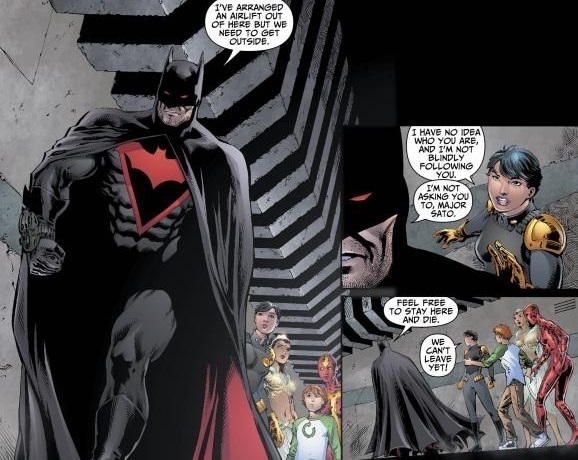 Ever since the new Batman first appeared in the Earth 2 Annual #1, the speculation about his identity has continued to build month after month, with each issue he subsequently appeared in teasing us with even more hints and clues about who he might be. Now as the forces of Apokolips begin their invasion, the identity of this mysterious character is finally revealed in this months eagerly waited Earth 2 Annual #2. Since Tom Taylor took over writing Earth 2 expectations for this issue have been high, so I’m happy to say that Taylor has really surpassed himself with this issue. Taylor sets the tone perfectly from the outset, as the gunshot rings out on that fateful night in Crime Alley, before we rejoin the story in 1994 as the original Earth 2’s Batman examines a corpse in the Gotham morgue. I like how Batman’s investigation ties directly into the man who killed his parents, Joe Chill, which in turn then leads the Dark Knight to Frankie Francavilla and the discovery of the events leading up to the murder of Thomas and Martha Wayne. Frankie finishes his story as the killer attacks the mansion and begins shooting the guards. Batman rushes to confront the balaclava clad intruder, but soon finds he is no match for the killers enhanced strength. Even though he is injured, Batman stands his ground, telling the assailant that Francavilla will answer for his crimes. 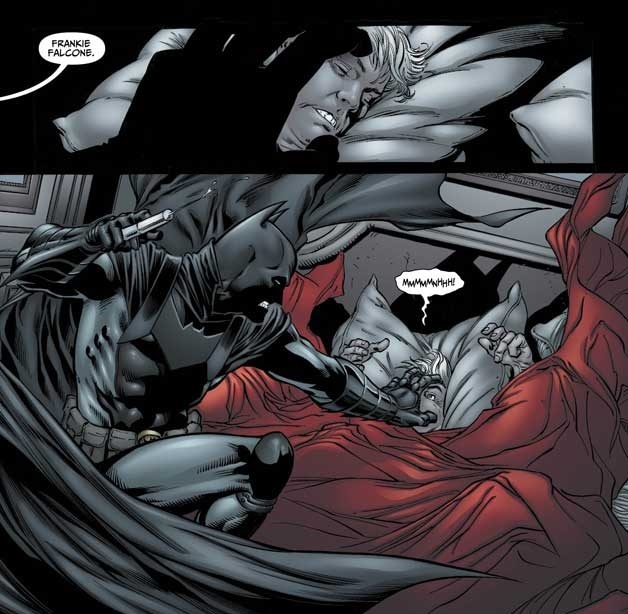 The Batman’s words seem to get through to the intruder, who suddenly breaks off the attack and escapes into the night. Earth 2 Annual #2 looks amazing. Robson Rocha’s pencils and Scott Hannah’s inks perfectly convey the dark, brooding atmosphere surrounding the new Batman’s origin. The flashback sequences are really good, especially the opening in Crime Alley, which has very a surreal and nightmarish quality to it. Its very clever how the scenes involving Thomas Wayne are intercut with Francavilla as he talks to Batman, while Peter Pantazi’s colors also helps enhance the different time periods, ensuring the narrative never once feels stilted, or forced. It’s also good to see the original Batman in action again, as we only really got to see him for one issue before he sacrificed himself to save the world. We get to see Batman searching for clues at the morgue, he frightens the living daylights out of Francavilla in the mansion, and the fights between Batman and the masked killer are also really fast and brutal. Taylor keeps us on the back foot, right up until the very end, until Batman follows the killer to the place where their lives will converge in the most startling discovery of all. Cometh the hour, the time comes for the new Batman reveal his true identity to his allies. The origin of this character, while steeped in the legacy of the Bat, also splices other aspects from the Golden Age to deliver an unexpected dose of nostalgia in a way few could have predicted. However, now this Batman’s allies know his strength, as well as weaknesses, we are left wondering if they will ever be able to trust him in quite the same way again? 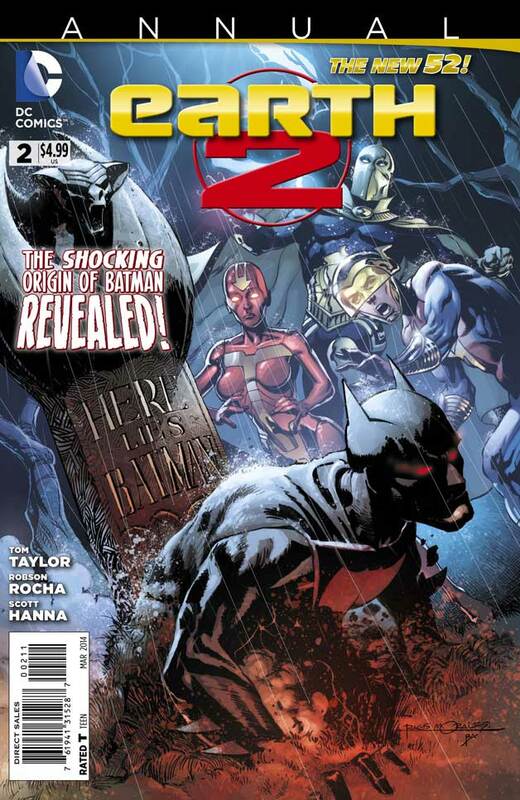 I really enjoyed the Earth 2 Annual #2; in fact, the story was so good I wanted to read it again immediately. Tom Taylor has crafted a brilliant origin for Earth 2’s new Batman, it’s been a long, agonising wait, but it’s sure as hell been worth it! Peter Capaldi’s Doctor Who Costume Revealed! 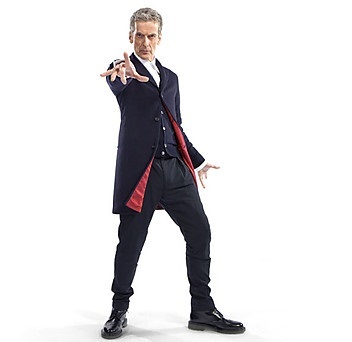 Today the BBC released the first picture of Peter Capaldi wearing the new Doctor’s costume. It seem the Doctor will have a brand new as Peter Capaldi’s era as the Time Lord officially beings. This costume features a dark blue Crombie coat, with red lining, dark blue trousers, white shirt, and black Dr Martin shoes. I think the new costume looks great, and I’m really looking forward to the new series with Peter Capaldi as the Doctor. 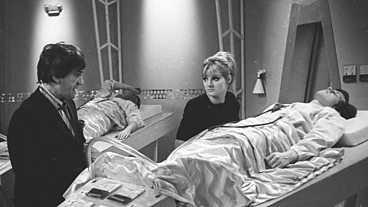 The TARDIS is thrown off course and makes a bumpy landing on the Moon in 2070 where the Doctor (Patrick Troughton) and companions Jamie (Frazer Hines), Ben (Michael Craze) and Polly (Anneke Wills) discover a weather control station where a mysterious plague has broken out. Jamie has been injured exploring the lunar surface, while he recovers the Doctor offers to help Hobson (Patrick Barr) deal with the epidemic. The Doctor discovers the illness was caused by an alien poison the Cybermen have used to contaminate the food stores after secretly entering the base. The Moonbase (1967) is the sixth story from Season Four, written by Kitt Pedler; it was the fourth story to feature Patrick Troughton as the Doctor. This latest DVD release from BBC Worldwide features the second appearance of the Cybermen in the series, having made their debut in William Hartnell’s final story The Tenth Planet (1966), they return with a completely new look. Patrick Troughton is also settling into the role of the Doctor, with the eccentricities seen in The Highlanders (1966/67) and The Underwater Menace (1966) giving way to a somewhat darker and more refined performance that would make Troughton’s second incarnation of the Time Lord so endearing for generations to come. Whilst there are indeed some striking similarities with The Tenth Planet, the Antarctic setting is transferred to the Moon, General Cutler and the Moonbase’s commander Hobson both run facilities with a diverse multi-national crew, and each story has subplots (The former involving a space capsule in peril and the latter a strange plague debilitating the crew) that are instrumental in facilitating the arrival of the Cybermen. However, it is the subtle changes which The Moonbase heralds that are so compelling, and the brilliantly redesigned Cybermen would go on to become one of the programmes most popular recurring monsters. Seeing how Jamie spends the majority of the story in the medical unit, Ben, and especially Polly, really impress in this story. Having encountered the Cybermen before, Polly recognises them instantly, Ben also recalls the events of the Tenth Planet and how Mondas was destroyed, but Hobson is not as easily convinced that the Cybermen have returned. Polly has some great scenes in this story: confident and resourceful, she helps tend the patients in the medical unit, later asking the Doctor about his medical qualifications as he investigates the cause of the plague, which she inadvertently helps solve with an impromptu coffee break, and she also devises a way to defeat the Cybermen using a special cocktail of chemicals to melt their chest units. 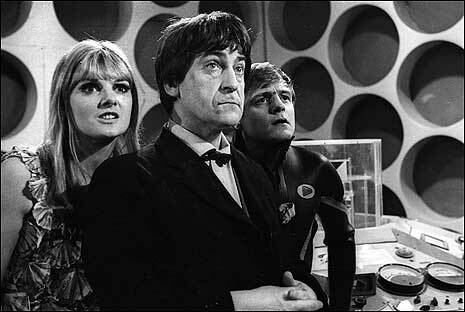 As the Doctor notes, there are dark corners of the universe which have bred the most terrible things, things that must be fought, and it is here, in this single moment of dialogue, together with the grave sincerity of Troughton’s performance, that virtually redefines the series in a heartbeat and effectively paves the way for one of the finest seasons in the programmes history – season five. For their return the Cybermen received a brand new look, the cloth faces, bizarre voices, and cumbersome costume of their first appearance is superseded by an altogether sleeker and more imposing form than their predecessors. These mark II Cybermen are now encased in a gleaming one-piece silver outfit, their chest unit is far more compact, a smooth metal helmet gives them a chillingly emotionless countenance, the Cybermen’s hands now just have three silver digits, and they can also fire bolts of electricity from their wrists. 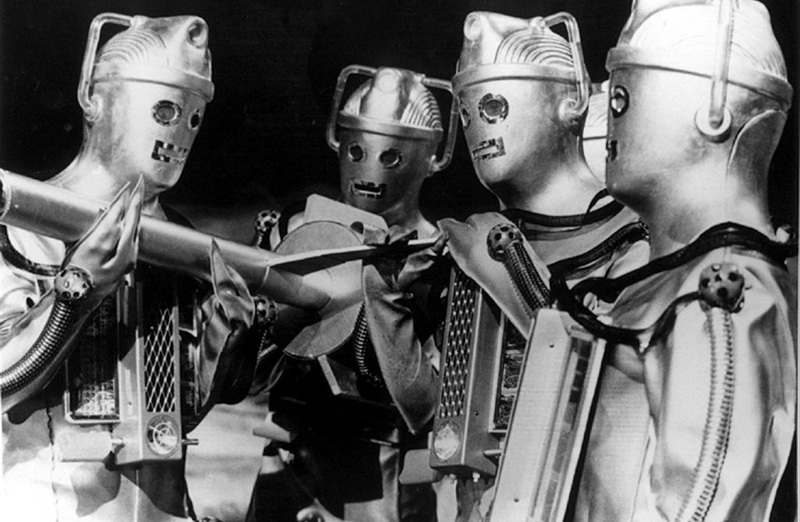 The new voices for the Cybermen, created by Peter Hawkins, are also very different, replacing the sing-song tones used in the Tenth Planet with some distinctly cold and highly effective electronic tones, which make the Cybermen seem even more emotionless and threatening than their predecessors. 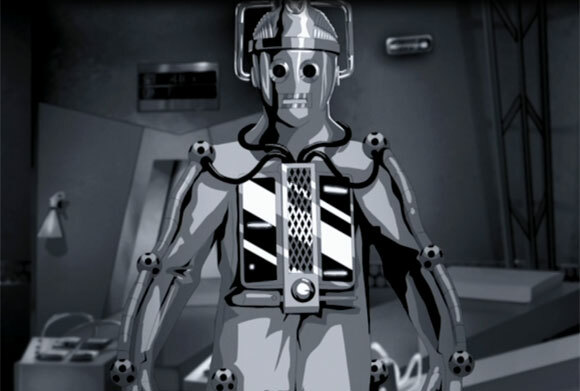 Though the Cybermen do not feature much in the first two episodes of the Moonbase, they certainly make their presence felt, creeping into the food stores to infect the sugar supplies with a neurotropic virus, there is a frightening scene were a Cybermen appears from the shadows and attacks Ralph (Mark Heath). Believing he is near death, Jamie wakes to find a Cyberman towering over him, and deliriously thinks he has seen the Phantom Piper as the Cybermen carries another sick crewmember away to its hidden spaceship. 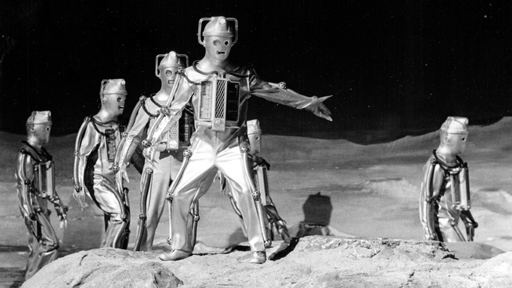 There is also a particularly eerie scene in episode two, where the Cybermen stalk and attack two crewmembers on the lunar surface. Together with some excellent lighting and stock music, director Morris Barry gradually heightens the tension, leaving the way clear for the Cybermen to dominate the last two suspense filled episodes, culminating in some impressive scenes where they march across the lunar surface to attack the Moonbase. This story was especially topical at the time, it was the height of the space race, and producer Innes Lloyd wanted a story set on the moon. The Moonbase is also notable for featuring Victor Pemberton – Story Editor on The Tomb of the Cybermen (1967) and scriptwriter of Fury From The Deep (1968) as one of the crewmembers, and John Levene, who would go on to play the role of Benton, also appears as a Cyberman extra in this story. Incidentally, the novelisation of this story (Doctor Who and the Cybermen) was penned by the unaccredited co-writer of The Moonbase, Gerry Davis. Unfortunately only episodes 2 & 4 of The Moonbase currently resided in the BBC archive, so for this special DVD release Planet 55 studios in Australia have used the same animation techniques employed on their restoration of The Reign of Terror and 10th Planet DVD’s, together with the surviving soundtrack, to recreate episodes 1 & 3 of The Moonbase so this four part story can be finally enjoyed again. The animation of these episodes is nothing short of phenomenal, the care and attention to detail makes this story come alive in a way that the audio soundtrack alone never could. The first episodes includes some great scenes of the TARDIS crew jumping around on the lunar surface in their spacesuits, and we also see the Cyberman attacking Ralph, but it is the third episode that is really special. We get to see the Doctor confronting the Cybermen, as well as Polly and the others devising their plan to fight back, the scene where the second Doctor seems to debate with himself about the Cybermen is brilliant, and the build up to the big reveal of the Cyber-Army is dramatically recreated. This feature packed release contains some excellent special features, including a commentary for episodes 2 & 4 by actors Anneke Wills (Polly), Frazer Hines (Jamie), Edward Philips (Scientist), and Brian Hodgson (Special Sounds Creator), with episodes 1 & 3 accompanied by interviews with Kitt Peddler’s daughters, Lucy Pedller and Carol Topolski, Lovett Bickford (Assistant Floor Manager), Cybermen actors Barry Nobel, Derek Chaffer, and Reg Whitehead, and the archive interview with producer Innes Lloyd. The commentaries are moderated and linked by Toby Hadoke. The standout extra on this disk though is Lunar Landings, a fantastic look back at the making of The Moonbase, featuring interviews with Anneke Wills, Frazer Hines, Reg Whitehead, and production assistant Desmond McCarthy. I really enjoyed hearing their memories about this story, Anneke Wills account of filming at Ealing for the weightless sequences on the Moon were fun to hear, as well as the story about Patrick Troughton’s lucky escape when part of the Gravaton set collapsed, and of course the DVD also includes a photo gallery, the superb production information subtitles, Radio Times PDF, and a coming soon trailer. While not exactly perfect, The Moonbase stands up fairly well, despite some padding in places and that ludicrous scene with the tea tray. Patrick Troughton is excellent as the Doctor, the regular cast have plenty to do, and the redesigned Cybermen are really impressive. The way they initially strike from the shadows is highly effective, stalking the base and kidnapping some of the crew, who are then subjected to a conversion process that reanimates them as Zombie-like slaves. Only the ending is a little disappointing when the Cybermen and their spaceships are rather unceremoniously dispatched. The Moonbase effectively sets the stage for the base under siege format that became so synonymous with the Troughton era, a template that would ultimately be honed to perfection the following year, in Season Five. However, there is still plenty to enjoy here, especially with Patrick Troughton’s great performance and Planet 55’s exemplarily work on the animated episodes, which makes The Moonbase DVD a welcome return to the early years of Doctor Who. Having left Wolverine’s Jean Grey School, the Original X-Men and Kitty Pryde decided to move to Cyclops’s New Xavier School. X-23, the genetic clone of Wolverine, has now joined the team after the teenage X-Men helped her escape from the super-powered son of William Stryker and his group of Purifiers. The Shi’ar, having learned Jean Grey is alive on Earth, return to capture Jean and place her on trial for the actions of Dark Phoenix. 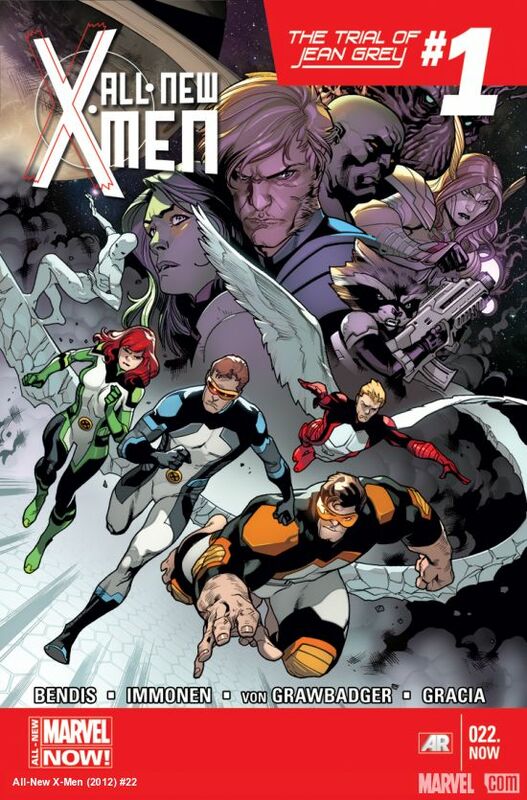 The All New X-Men must join forces with the Guardians of the Galaxy in order to Jean from intergalactic justice. The Trial of Jean Grey gets off to an exciting start as the Shi’ar sets out to capture Jean Grey and put her on trial again. All New X-Men #22 has some great moments for the Original X-Men as they settle into everyday life at the New Xavier School, followed by some explosive action when the Shi’ar attacks. This crossover event between the All New X-Men and the Guardians of the Galaxy looks very promising, and is sure to test the young mutants to the limit. While the rest of the X-Men seem to be adapting well to being at the New Xavier School, tensions are still running high between Jean and Scott, which leads to a brilliant scene where the two of them argue in the cafeteria while Angel is trying to eat his lunch. 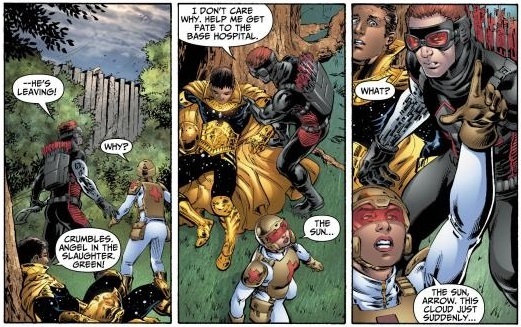 Brian Michael Bendis pitches this scene perfectly, striking just the right balance between the tension and humour, as Scott tries to ask Jean about how she is coping with her knowledge of the future. Its fun to watch Angel react as, just like the reader, he only gets half of the conversation, because some of it takes place telepathically between Jean and Scott after she inadvertently reads Scott’s mind without his permission again. The rest of the issue features the Shi’ar’s attack on the New Xavier School, which is the big highlight of this issue. Its also great to see Stuart Immonen back on All New X-Men as well, his gift for capturing the characters emotions and ability to deliver epic action sequences are perfectly suited to this title. All New X-Men #22 provides an exciting start to The Trial of Jean Grey, I feel there is a lot of potential here, and it will be great to see the original X-Men venturing into space with the Guardians of the Galaxy to rescue their team-mates. A former scientist at Wayne Enterprises, Dr Karl Helfern, now horrifically disfigured by the formula he created which causes accelerated bone growth, has returned as Dr Death and used his own serum to murder the team of scientists he used to work with. With Lieutenant Gordon’s help, Bruce and Lucius Fox were able to escape from Dr Death. Despite suffering a cranial fracture, Batman tries to save the last two scientists, only to find that they have already been killed by Dr Death and the GCPD are waiting to ambush him. Batman must find a way to escape from the Police, as well as confront his differences with Gordon, if he is to have any chance of tracking Dr Death to his secret lair before the super storm hits the city. The penultimate issue of Dark City beings with a flashback to Tokyo 1946 before returning to the Newton Centre, where Batman finds the scientists have been murdered by Dr Death, and the GCPD have cornered the Dark Knight and opened fire. The Dark Knight Detectives early years continue to unfold explosively in Batman #27, with the GCPD’s attack cutting off Batman’s escape, leaving him reeling from a hail of bullets. With the inclusion of Dr Death over the last few issue, the Dark City section of Zero Year has taken on a very distinct tone and feel, with this classic villain almost symbolically representing the twisting scar tissue that has healed over the terrible loss Bruce suffered on that fateful night in Crime Alley when his parents were murdered. Scott Snyder has also explored the relationship between Bruce and Lieutenant Gordon with Dark City, flaying open the old wounds that have played such a vital part in forging the direction both of their lives have taken. Batman #27 provides a fascinating insight into the story behind the trench coat from last issue, as the faint glimmer of hope which Gordon thought he had found earlier on that day, so long ago, was ultimately dashed by the corruption within the CGPD and the tears of a young orphan’s terrible loss. If you were still pondering over last issues other intriguing flashback, which showed Bruce, suspended in cell over a vast pit in the Sudan, then Batman #27 yields a very unexpected, and highly emotional payoff. I really like how Scott Snyder has explored Alfred’s role during these early years over the course of Zero Year. It’s also been fascinating to watch this angrier, less disciplined, Bruce Wayne take to the streets as Batman and begin his war on crime. Alfred’s concerns for how Bruce is dealing with his anger provides this issues best moment, as he does not want to see Bruce let the dark scars of the past consume him. This fantastic scene brings Bruce’s motivations for being Batman into focus like never before, as Alfred urges him to reach out to those who can help, to become a force of justice, and hope for a city riddled with crime and corruption. Just as Snyder is absolutely bang on the money when it comes to writing Batman, I think Greg Capullo’s work on Batman has also been outstanding; his incredible attention to detail and the realism he continues to bring to every issue is superb. The opening scenes alone are nail bitingly tense as Batman makes his escape attempt. It’s during the quiet moments though, particularly in the scenes involving Gordon, and then later with Alfred, where Capullo’s brilliant renditions of these characters expressions perfectly captures the emotional impact of these events on Bruce. We also see the first time Batman disappears while Gordon is still talking. Add to that a glimpse of Batman on a storm drenched night, one guaranteed to send a few iconic shivers of nostalgia down your spine, which together with this issues exciting conclusion, will leave you on the edge of your seat as Batman discovers he has gravely underestimated his opponents. Danny Miki’s inks are as excellent as ever, accentuating Capullo’s art perfectly, while FCO’s amazing use of color continues to play a major role in making Zero Year so enjoyable, with the vivid purple and red tones for Batman’s daring escape from the Newton Centre giving way to the sombre blues and greys of the flashbacks, while a ghoulish palette of emerald hues accompanies Batman on his descent into the catacombs to find Helfern’s lab. Capullo’s cover for Batman #27 is also really good, disturbing and compelling in equal measure; this image of Batman’s costume twisted and distorted by Dr Death’s formula has quickly become one of my favourite Zero Year covers. Batman #27 takes Dark City into completely unexpected territory. 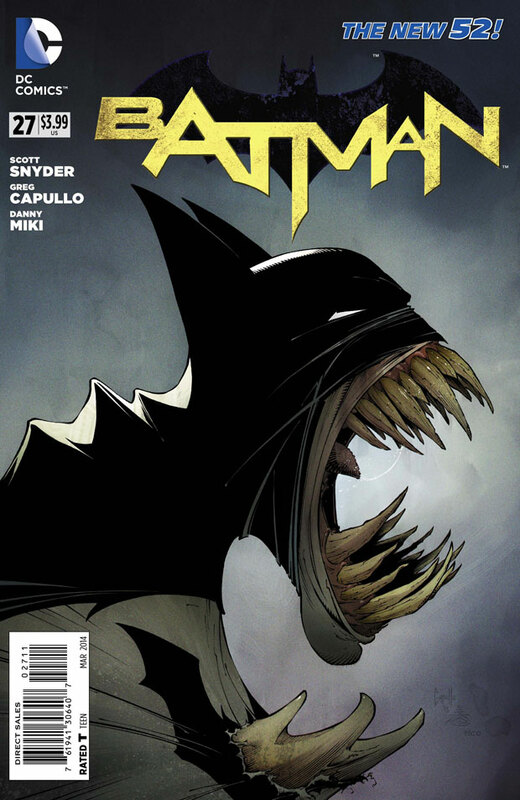 Scott Snyder effortlessly manages to draw together several of the plot threads that have now become so indicative of Zero Year, which considering this is only chapter two of his retelling of Bruce Wayne’s early career as Batman, it points to there being even bigger, and greater surprises awaiting us in the third chapter. As Dr Death’s plans are revealed and the Riddler’s grand schemes begin to take shape, next months special Batman #28 will offers us a glimpse into the future, before we return for Batman #29 and the conclusion of Dark City in March. 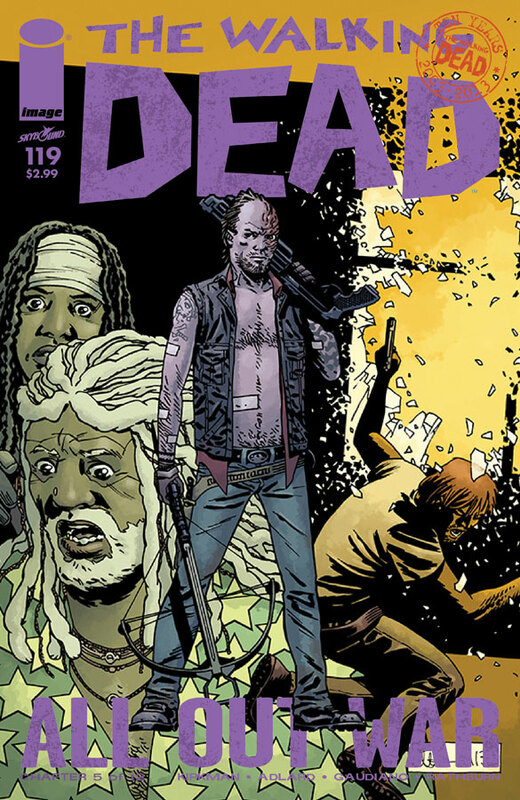 The Walking Dead #119 picks up the pace as Robert Kirkman serves up a dramatic mix of character moments and action. Ezekiel is still reeling from the terrible loss his group suffered last issue; he blames himself for the slaughter, as well as Shiva’s fate, believing he cannot be a leader anymore. I think Kirkman has done a fantastic job in developing Ezekiel’s character over the last few issues, as well as his relationship with Michonne, and it is her no nonsense approach to reminding him about his responsibilities that really hits home this issue. We also see Arron as he tries to come to terms with Eric’s death, and there is a great scene where Carl still tries to act tough even though he is really pleased to see that his father has returned safely. Charlie Adlard’s art is as good as ever, he perfectly conveys the characters emotions, striking just the right balance between suspense and the grim reality of the zombie apocalypse, with inker Steafano Gaudiano enriching the depth and tone of Adlard’s art. The Walking Dead #119 races towards a dramatic confrontation between Rick and Negan, with tension running high on both sides, and the closing moments provide a shocking cliff-hanger. Any doubts about this All Out War storyline being padded out more than necessary are soon quelled after reading this issue. Kirkman continues to keep things moving along at a brisk pace, there is some great character development, and the brilliant finale scenes prove that this war is about to get a whole lot nastier before it’s over. 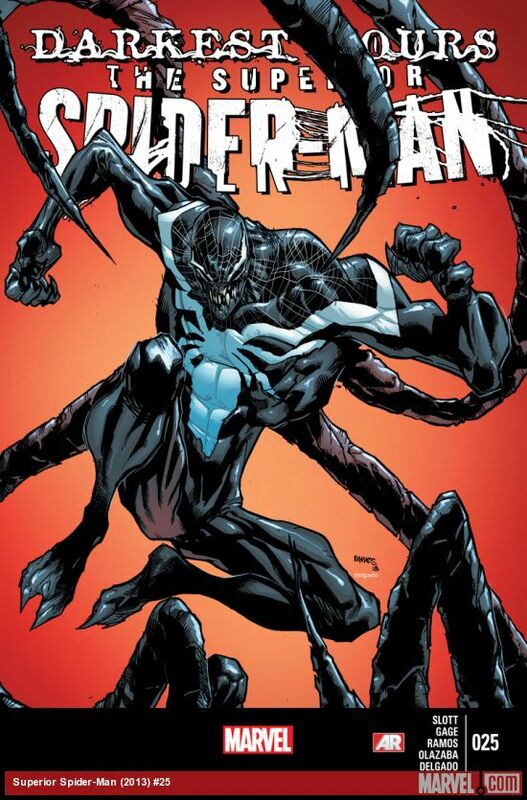 The hype surrounding the return of Peter Parker has made the build up to Superior Spiderman #25 all the more exciting, with Spidey (Otto Octavius) having wrested control of the Venom symbiote from Flash Thompson, MJ called in the Avengers who soon arrived to deal with the threat posed by the new Superior Venom. While Otto attempts to control the symbiote and fights the Avengers, Flash Thompson must find a way to be rejoined with the symbiote if he is to survive, and as the Hobgoblin’s conflict the Green Goblin escalates, a new Goblin is born. Dan Slott and Christos Gage keep this action packed issue rattling along at a cracking pace. The Avengers are soon locked in battle with the Superior Venom, with Captain America and even Thor unable to contain the enraged Otto-Venom. It’s a good job the conclusion of Darkest Hours is a giant sized 25th issue of Superior Spiderman, as there is so much plot to cram in, especially with Norman Osborn’s plans also taking shape, Carlie Cooper’s shocking transformation, and the Hobgoblin preparing to strike back against the Green Goblin. Humberto Ramos does a great job of all brining all the big action sequences together. The fight between Superior Venom and the Avengers is full on, with Otto’s strength and intellect proving to be more than a match for them. While Cardiac and Flash recover in hospital, a surprise visitor arrives with a plan to help Corporal Thompson. The general public have also grown tired of Spiderman’s recent actions, it seems that watching him battling against the Avengers is the last straw, and they begin to turn against his robotic spies. Superior Spiderman #25 builds to an exciting conclusion, as the Hobgoblin’s operatives are faced with a new Goblin, Dan Slott and Christos Gage also throw in a great surprise as the Avengers attempt to free Superior Spiderman from the Venom symbiote – one that is sure to have very significant implications for the future. This has been one of my favourite issues so far. Now with Otto retuning to his scheming ways, things are set to get even more complicated, especially as suspicions have been roused amongst those closest to him. Although I’m looking forward to Peter Parker’s return in April, I have really enjoyed Superior Spiderman as well. It’s been a great title, and I’m looking forward to what Slott has in store as the Goblin Wars begin! Tom Taylor continues to make his stamp on this series as Earth 2 #19 kicks into overdrive. As Superman departs with his captives, Dr Fate is still delirious after his battle with the man of steel, and Red Arrow must face the Parademons attack. Having killed the Joker in his stasis chamber, Batman informs Major Sato and the others he has arranged an airlift for them. Jimmy Olsen reveals he was imprisoned for hacking Sloan’s personals files, were he learned about the alien Sloan keeps in Arkham’s sub basement. Major Sato denies all knowledge but Red Tornado quickly pinpoints the location and Aquawoman smashes a way into the sub basement. As they make their way into the sub basement Taylor uses this opportunity to explore the new characters introduced last issue. We already knew Jimmy Olsen was part of the Accountable, a terrorist group that hacked the World Army systems and released thousands of documents online, his photographic memory also proves invaluable, and the reasons for his incarceration soon become clear. Aquawoman is a real force to be reckoned with, she uses her immense strength to break into the sub basement, and the guards there can offer little resistance. Furthermore, considering the atrocities we lean the World Army have inflicted on the Queen of Atlantis and her people; Marella is surprisingly merciful to these soldiers considering how easily she could have killed them. The mystery surrounding Batman continues to build as they make their way towards the cell holding the alien. His ambivalence towards Red Tornado is particularly striking, especially as Lois Lane now inhabits the androids mind, and she obviously knows more about this Batman’s predecessor than he seem to know about her. The identity of the alien is another of Earth 2 #19’s big surprises, as is the reaction to one of its rescuers. From the opening scenes of the Parademons swarming in front of the sun, through to Superman’s devastating attack on Washington, the big action set-pieces are stunning. The pencils for Earth 2 #19 are provided by Nicola Scott and Robson Rocha, with inks by Trevor Scott and Oclair Albert, with colors by Pete Pantazis and letters by Dezi Sienty. I like how the mystery slowly unfolds in Arkham, with all the characters getting a good share of the action, before Superman goes balistic with the Washington Monument. The reason for capturing Mr Terrific and Sloan also becomes clear as Bedlam attempts to take control of their minds. Earth 2 #19 is one of Tom Taylor’s best issues so far, The Dark Age storyline has given us plenty of surprises already, and with this third instalment Taylor keeps us guessing right up until the final page as the pieces begin to fall into place. To say more would absolutely ruin the intricate plot twists that Tom Taylor has woven into this superb issue. 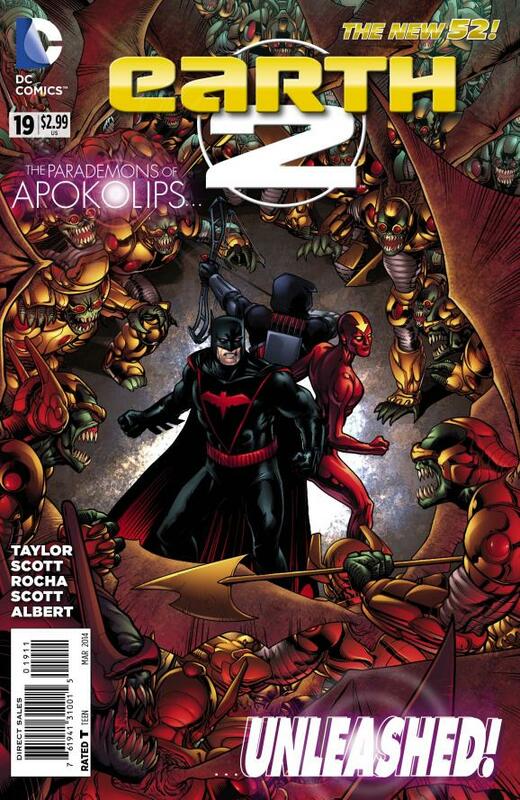 Instead, prepare to be swept along by the epic scope of the story and art as Apokolips sets its sights on Earth 2, and look forward to the discovering the new Batman’s origin in the Earth 2 Annual #2. Today the BBC released the first picture of Peter Capaldi on set with Jenna Coleman as filming began on series 8 of Doctor Who. The new Doctor, Peter Capaldi, stepped on set today for his first full day of filming as production begins on series 8 of the hit BBC show. 10.2 million tuned-in on Christmas Day to get their first glimpse of Capaldi in one of TV’s most iconic roles in the festive special The Time of the Doctor, which saw Matt Smith hang-up his bow tie after 4 years in the role. Capaldi was revealed as the Doctor in a live BBC One show in August, after months of speculation about the next Doctor’s identity. Arriving on set in Cardiff to begin filming, Peter Capaldi said: “New job, first day, slightly nervous. Just like the Doctor, I’m emerging from the TARDIS into a whole other world. 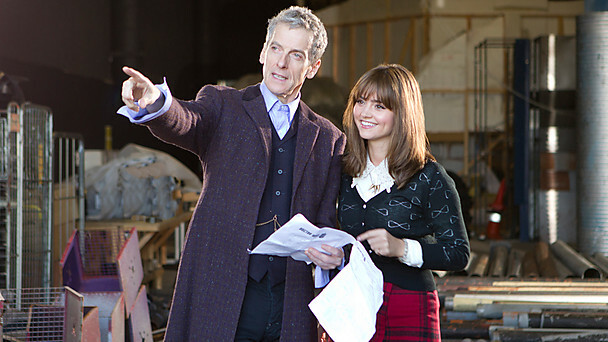 Accompanying the Doctor on his adventures will be companion Clara Oswald, played by Jenna Coleman. The first episode of series 8 has been written by Steven Moffat with the second episode penned by Phil Ford. These are the first episodes that Peter will shoot and are directed by Ben Wheatly. Filming is taking place in Cardiff until August 2014.